What browsers do you support and do I need any special software? How do I access an existing users data? What types of charts do you support? How much historic data can I store? Where is my data stored and is it secure? Do you have a service level guarantee? What types of data loggers, PLCs and RTUs are supported? What connection options are supported? What level of functionality do you provide for connected data loggers? Can I connect to my data logger using 3rd party software? What types of time series data files do you support? What file transports do you support for automatic collection? Can I upload other types of files? Do you support cameras sending images or video files to eagle.io? Do you support live streaming video? Nodes are the container objects that store all data and configuration for your projects. There are various types of nodes including: Workspaces, Groups, Locations, Dashboards, Attachments, Sources and Parameters. A Node can be referenced programmatically using either a Node Id (globally unique) or a user-defined Custom Id (unique to your account). These identifiers can be found (and Custom Id configured) at the bottom of the Properties for each Node. A Node Id is a 24-character alphanumeric string that uniquely identifies a Node in eagle.io. It is generated by the system and cannot be changed. A Custom Id is a 255-character user-defined string that uniquely identifies a Node in your account. A Custom Id is prefixed with the @ symbol and must not contain the following special characters: dot ., underscore _ and hyphen -. In the example above, the Custom Id has been set to sensor_254. Consumers of Nodes should tolerate the addition of new attributes and variance in ordering of attributes with ease. Not all attributes appear in all contexts. It is generally safe to consider a nulled attribute, an empty set, and the absence of an attribute as the same thing. description String Yes Description of attachment as set by user. fileUrl  String Attachment URL. Requires ATTACHMENT_READ permission. Optionally specify an expiry period for the URL. filePreviewUrl  String Preview URL. Only included if the attachment is a valid media file. Requires ATTACHMENT_READ permission. Optionally specify an expiry period for the URL. Note: image dimensions may change without notice. controlValue Variable Yes Pending control value. Type inherited from _class. timezone String Yes Timezone of Source data. (1, 2) Certain attributes can not be used in filter criteria. Retrieve a list of all nodes available to the authenticated API key. Optionally filter by attribute values. expiry 60 Optional. Expiry period in minutes for any included resource links. ie. fileUrl for Attachments. Default is 0 (no expiry). Expired resource links will return 403 Forbidden. (1, 2) When TREE type is specified the filter, limit, skip and sort arguments are not allowed. Retrieve a node by its id. You can use the automatically assigned _id or your own customId prepended with ‘@’. Create a node (currently limited to creation of Workspace and Group). You must specifiy both the _class and a unique name. Creating a Group also requires a valid parentId. Update a node by its id. You can use the automatically assigned _id or your own customId prepended with ‘@’. Updates are limited to the attributes listed with the Update flag. Multiple attributes can be updated in a single request. The updated node will be returned in the response if the request is successful. You can optionally limit the returned attributes by specifying the attr argument. Refer to the examples below when updating complex attributes such as alarms and states. Alarm configuration can be included in the update request for Location, Source and Parameter nodes. You must specify each alarm type as a nested attribute containing the config to be updated. Only changed attributes need to be specified. isEnabled Boolean Enable or disable the alarm. Overload alarm can not be disabled. notify String When notifications should be triggered: [NEVER, ALWAYS, AWAY_FROM_NORMAL, TOWARDS_NORMAL]. qualityTypes Array Only valid for qualityAlarm. List of quality types that will trigger this alarm: [GOOD, BAD, UNCERTAIN]. stateAlarm has no direct configuration. Modify states to change state alarm behaviour. States configuration can be included in the update request for Number and Text Parameter nodes. Number parameters can use either DISCRETE or RANGE states. Text parameters are limited to DISCRETE states only. States can be reset to parameter defaults by updating the states attribute with null. Update existing states by providing the _id attribute for each state in the request. Any states without the _id attribute will be ignored. Only changed attributes need to be specified. If no states in the request contain an _id attribute the update will Replace the existing states. RANGE states for number parameters must always be specified in ascending order based on threshold and there must be one state with the name attribute set to NORMAL. Refer to Parameter states for further information. State type for number parameters can be changed with the statesType attribute. When changing statesType you should specify new states configuration or default states will be applied. threshold Variable Required. Unique threshold value for the state. Number parameters require a Double. Text parameters require a String. occurrences Int32 Optional - Default is 1. Minimum number of repeat values equal or beyond threshold required to trigger state: 1-15.
isAlarm Boolean Optional - Default is FALSE. Flag to indicate if this state should raise an alarm. Not valid for NORMAL RANGE state. messageAway String Optional. Custom message to send when the state becomes active (away from normal). Maximum of 255 characters. Leave empty for default message. messageTowards String Optional. Custom message to send when the state becomes inactive (towards normal). Maximum of 255 characters. Leave empty for default message. qualityCode Int32 Optional - Default is null. Quality code to apply to acquired data that matches this state: 0-65535. Delete a node by its id including all child nodes. You can use the automatically assigned _id or your own customId prepended with ‘@’. Clone a node or create an instance from a template by its id. You can use the automatically assigned _id or your own customId prepended with ‘@’. You must specify a valid parentId as the destination for the clone/create operation. Optionally include name and metadata to be assigned to the newly created node. Not available for TRIAL accounts. Workspace cloning not currently supported. Required API key permission: Modify. Acknowledge active alarms for a node by its id. You can use the automatically assigned _id or your own customId prepended with ‘@’. Optionally provide a comment for the acknowledgement. "message": "Operation accepted but not yet complete"
Clear active and acknowledged alarms for a node by its id. You can use the automatically assigned _id or your own customId prepended with ‘@’. Trigger an acquisition (Acquire Now) for a Source node by its id. You can use the automatically assigned _id or your own customId prepended with ‘@’. Retrieve a list of all users and groups subscribed to receieve notifications for a node by its id. You can use the automatically assigned _id or your own customId prepended with ‘@’. Subscribe a list of users and groups to receieve notifications for a node by its id. You can use the automatically assigned _id or your own customId prepended with ‘@’. Unsubscribe a list of users and groups from receieving notifications for a node by its id. You can use the automatically assigned _id or your own customId prepended with ‘@’. Retrieve a list of all users and groups with access to a workspace (or node) by its id. You can use the automatically assigned _id or your own customId prepended with ‘@’. When a user is included in a group that has been provided access, the user entry may contain an effectivePermissions attribute which combines individual user and group(s) permissions (where different). Add a list of users and groups to a Workspace by its id and set or update user security roles. You can use the automatically assigned _id or your own customId prepended with ‘@’. You must specify a valid role name that has been preconfigured in account settings. If the user (email address) does not already exist a new user profile will be created and a profileActivateUrl will be returned so the user profile can be finalized by navigating to the url in a web browser. When adding a new user (profile does not exist) you can optionally include attributes: name, phone, timezone, timezoneAdjustForDst and timeFormat. Remove a list of users and groups from a Workspace by its id. You can use the automatically assigned _id or your own customId prepended with ‘@’. Retrieve historic data from a node by its id. You can use the automatically assigned _id or your own customId prepended with ‘@’. Data can be returned in JSON (JTS) or CSV format. Use the Historic resource for extracting historic data from multiple nodes in a single request. Only available for Location and Parameter nodes. timezone Etc/UTC Optional - Default is Etc/UTC. Timezone applied to timestamps. Aggregate interval and baseTime calculations will also use this zone. timezoneAdjustForDst FALSE Optional - Default is FALSE. Flag to indicate if timestamps should be adjusted for DST in selected timezone. timeFormat YYYY-MM-DD HH:mm:ss Optional. Time format. limit 100 Optional. Maximum number of historic records to be returned. renderFormat 0.000 Optional - Default is node format. Format to apply when renderType is VALUE. ‘#’ must be URL Encoded as ‘%23’. aggregate AVERAGE Optional - Default is NONE (raw). Historic aggregate to apply to extracted data. baseTime D Optional. OPC Base Time required for aggregation. interval 3H Optional. OPC Interval required for aggregation. (1, 2) startTime or endTime can be omitted when limit is specified. Retrieve historic chart image from a node by its id. You can use the automatically assigned _id or your own customId prepended with ‘@’. Chart images can be returned in PNG, JPG, SVG and PDF format. If a chart node is specified, you can optionally specify: format, width, height, title, subtitle, startTime, endTime, timezone, timezoneAdjustForDst. If a parameter node is specified, the nodes’ pre-configured (or default) chart settings will be used but you can optionally specify any of the arguments below. Use the Historic resource chart endpoint for generating an adhoc chart using data from multiple parameters in a single request. Only available for Parameter and Custom Chart nodes. (1, 2, 3, 4, 5) Only available when specifying a parameter node. Update historic data for a Parameter or Location node by its id. You can use the automatically assigned _id or your own customId prepended with ‘@’. Data can be inserted in JSON (JTS) or CSV format. Use the Historic resource to update historic data for multiple nodes in a single request. writeMode MERGE_OVERWRITE_EXISTING Optional - Default is MERGE_OVERWRITE_EXISTING. See all available write mode options. notifyOn LATEST_ONLY Optional - Default is LATEST_ONLY. When to generate events, raise alarms and send notifications: [ALL_NEWER, LATEST_ONLY, NONE]. ALL_NEWER: All events newer than parameter current value. LATEST_ONLY: Latest event newer than parameter current value. columnIndex 0 Optional - Default is 0. Index of column in data to be associated with this parameter. Will use index specified in JTS Doc header if available or default to 0. 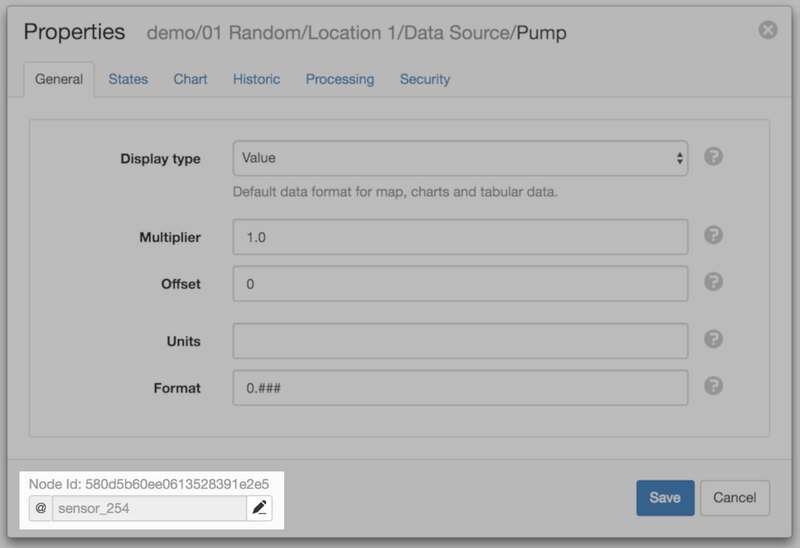 Update historic data for multiple parameters via a Data Source node id. You can use the automatically assigned _id or your own customId prepended with ‘@’. Data can be inserted in JSON (JTS) format. New parameters will be automatically created. The JTS Document must contain header columns. Each column must either specify a series or parameter id. If id is provided it will be used to match to the associated parameter under the current Data Source, otherwise the associated parameter will be matched using the series attribute. If a column specified in the header can not be matched to an existing parameter (and series was provided), a new parameter will be created automatically. Optionally specify name, dataType (NUMBER, TEXT, TIME. Default is NUMBER) and units in the column header which will be used when creating new parameters. Update historic data for a node with a single value with optional quality and timestamp. You can use the automatically assigned _id or your own customId prepended with ‘@’. If timestamp is omitted the time the request was made will be used. Existing values with the same timestamp will be overwritten. Delete all historic data from a node by its id. You can use the automatically assigned _id or your own customId prepended with ‘@’. © Copyright 2019 Argos.io Pty Ltd. Last updated on April 16, 2019.